Welcome to our Ischia blog, Good Morning Ischia! Here you can see the entry for Sunday 27th October 2013. The first thing to note about this morning is that the clocks have gone back. This means that we should wake up slightly happier, having had that extra hour in bed and a full Sunday to look forward to! There are a few clouds around this morning but they should start to burn off fairly quickly and leave us with another nice, sunny day with temperatures around 24° celcius/76° fahrenheit this afternoon. Today's photo is of Chiaia Beach in Forio. Close to the town centre with all of its shops, bars and restaurants, Chiaia is the most central of the four beaches that we list in Forio. The town has arguably some of the best beaches to choose from on the island with the likes of Citara, Cava dell'Isola and San Francesco also within its borders. Chiaia is a favourite for families for various reasons, apart from the aforementioned proximity to the facilities on offer in the town centre, it also boasts large areas of shallow water which are great for young children to paddle around in, especially if they're not particularly strong swimmers. 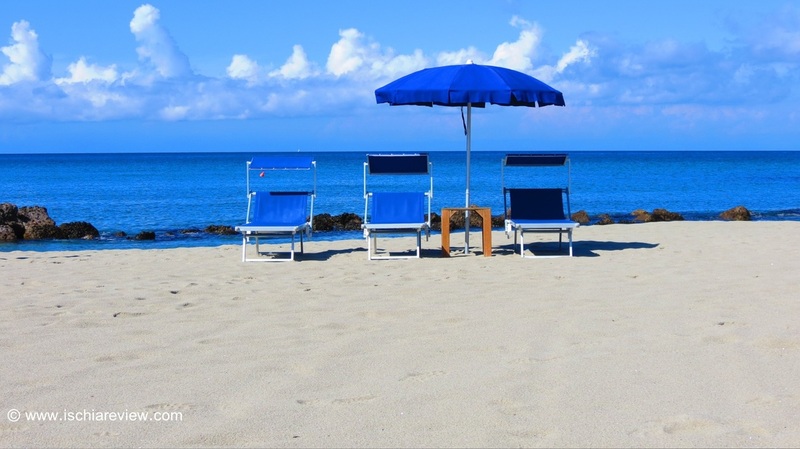 As with most of the beaches in Ischia, there are areas of Chiaia where you can pay for a sun-lounger and umbrella, but also plenty of wide, expansive areas of free beach where you can just turn up with your towel and stay there for as long as you like. We have a guide to the beaches in every part of Ischia that is divided into each town, Ischia Porto & Ischia Ponte, Forio, Casamicciola, Lacco Ameno, Sant'Angelo and Barano so have a look in there if you're planning a day on the beach and not sure which one to choose. Apart from that, drop us a line if you need anything and enjoy that extra hour of the weekend, I'm off to the beach!